Kids' City is a children's charity providing out of school play, activities and childcare in disadvantaged areas in South London. It was started by a bunch of parents and school staff in 1995 and now it works in 16 primary schools before school, after-school and during school holidays. The organisation is a social enterprise so it operates like a business but looks to make a social change, not a financial gain. It makes a charge to parents who can afford to pay and has a range of ways for families to get involved, for example by exchanging their time as volunteers so their kids come along for free. 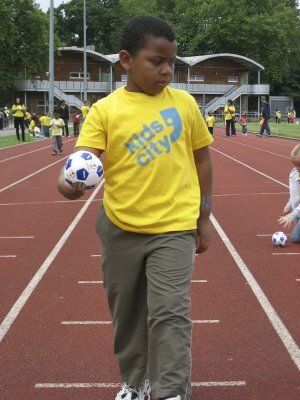 Kids' City has a wide volunteering programme and runs its own training centre and through this it assists unemployed people, particularly mums wanting to get into work, to get play or sports qualifications. Kids' City is a community effort with young people from 14 up to 70 offering their help in all sorts of ways. Even the children in the schemes help out with giving ideas, deciding what toys to buy and designing activities programmes. Many adults forget that in a relatively short time, the sorts of places they used to play in as children have disappeared through heavy traffic, housing developments and general fear of crime. The streets of London are much tougher places for today's children but organisations like Kids' City offer alternatives to computer games, tv and the anti-social activities that can follow through boredom and perceived disconnection from society. The work that Kids' City does builds individual's self esteem and perhaps most importantly, good communications skills, sense of purpose and promotes a real sense of belonging. The positive impact as judged by the local community can be measured in that over 220 local volunteers have come forward to help the full and part time workers employed by Kids' City in the running of their centres. There are several things that Kids' City like about Pier 32. One is that we've been able to deliver the clothes they need for their staff without compromising on their ethos to do good in every way they can. There's no point in helping children today and harming children of tomorrow or children in other countries! Secondly, over the years they've gone from ordering relatively small amounts of our cheaper lines to today's comprehensive staff uniform of t-shirts, fleeces and outdoor coats. They feel they've always received excellent service including advice about robustness, the 'right' colour yellow, and we've been very happy to liaise directly with their designers (also volunteers) in non-standard ways. They feel that their staff look good and the clothes meet their needs for functionality and practicality. And as a busy medium sized charity, they often need things in a hurry and despite this they note that "there has never been a hint of frustration in Gerry's voice" when they ring! Of course, Kids' City are price conscious and annually review costs. This tells us that Pier 32's clothing is very competitively priced despite the benefit they get from the added value of the ethical sourcing and the excellent service. Kids' City continue to be glad to do business with Pier 32 and you can see examples of our successful partnership in their annual report on the home page at www.kidscity.org.uk.